Tim joined Ramapo Rescue Dog Association in 1976, and throughout the years served as dog handler, Secretary, Treasurer, Board member and the unit’s Operational Leader. He was an evaluator for both the American Rescue Dog Association and the Ramapo unit. Tim also taught at the National SAR School on Governors Island, gave numerous lectures and presentations throughout the years and contributed to many books and publications. As the Chief Park Ranger for the Palisades Interstate Park Commission in Bear Mountain, NY, Tim was responsible for search and rescue operations, land surveys on state park lands, forest fire suppression and the operation of the weather station to determine fire danger. He was the longest reigning state employee in the history of New York State, retiring in June 2011 after 66 years. 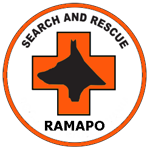 Tim was a pillar of the Ramapo unit and the search dog community at large. His knowledge of search and rescue was unsurpassed and resulted in the safe return and recovery of numerous individuals over the years. Emil was one of Ramapo’s original founders and incorporators in 1971. In the following years he served as Ramapo’s Base Camp Operator, Vice-President and Board member. He was the American Rescue Dog Association’s official representative to the National Association for Search and Rescue for many years, often taking care of necessary expenses on his own. He also served as an RRDA and ARDA evaluator. Emil was one of the unit’s most knowledgeable and sought-after support members. A perfectionist, he was also a wonderful and patient teacher, helping trainees and accompanying handlers on numerous searches over the years. And though not a SAR dog handler himself, Emil trained and competed in AKC obedience trials, taking his wonderful German Shepherd Dog, Greif, to his AKC Utility Dog obedience title in the mid 70’s. 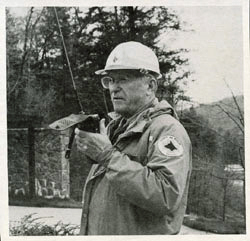 Throughout the years, Emil continued to sustain and mold the unit, helping in large measure to ensure the Ramapo Rescue Dog Association as it is today.